This LED Bluetooth Speaker gives you a special visual experience during dark night. 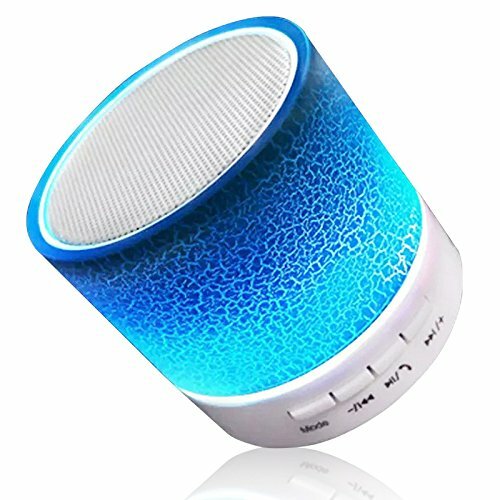 Portable bluetooth speaker makes you enjoy a high definition stereo sound with an impressive volume for travel&hiking,camping,driving,outdoor adventure. Use with phones, tablets and almost any other Bluetooth-enabled device. also support non-bluetooth function device with aux line. 【CLEAR SOUND MINI SPEAKER】:Enjoy music freedom, full-bodied sound with impressive volume, experience clear sound with powerful volume,and the consequences is beyond your imagination. 【LED LIGHT】:With color lights and the lighting can change color with the music rhythm automatically. Creating relaxing ambiance and dyeing very cool colors for the music. 【PORTABLE DESIGN SPEAKER】:Portable wireless bluetooth speaker delivers powerful clear sound. the mini design make you carry it convenient in your pocket. ideal for travel, hiking, riding, driving and so on. 【WIRELESS & WIRED CONNECTION】:Provide the most stable and seamless connection with most of Bluetooth devices or connected to non-bluetooth devices with 3.5mm audio cable (included). 【LONG LASTING & HANDSFREE】:Built-in HD microphone to support hands free call, without holding your smartphone.It also can be used as a hand- free Speaker Phone.